Liuchen Chang, a professor of the department of electrical and computer engineering at the University of New Brunswick, is being recognized as one of the province’s top researchers. Dr. Chang is receiving a New Brunswick Innovation Foundation R3 Innovation award at a gala dinner on March 23. The award celebrates the innovations of New Brunswick’s leading applied researchers. Dr. Chang is receiving the award for his pioneering renewable energy conversion and systems work. Dr. Chang has developed ways for energy to flow from small sources on the grid, rather than just having the grid deliver electricity from big plants. For the past 20 years, Dr. Chang and his research group studied and developed innovative technologies in renewable energy and distributed generation systems. Over the last decade, that research has expanded into developing intelligent load management for smart grid systems. David Burns, vice-president of research at the University of New Brunswick, applauds Dr. Chang’s work over the past two decades. 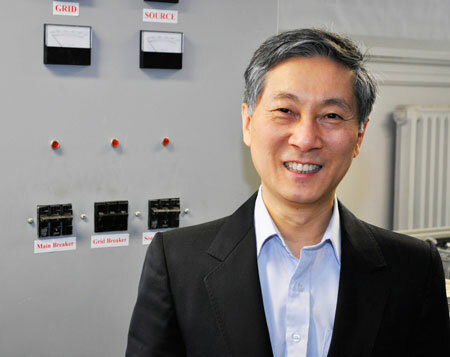 Dr. Chang’s research opens the door for New Brunswick entrepreneurs interested in smart grid. The opportunities to utilize his findings are many, including developing load management systems and smart devices, such as water heaters, for homes. For example, a business could provide new resources to a power system operator and generate revenue by integrating intelligent management technologies of many small loads. Dr. Chang is one of three honourees at the foundation’s gala event at the Fredericton Convention Centre on March 23. Also receiving awards are Alain Doucet of Collège communautaire du Nouveau-Brunswick and Amber Garber of the Huntsman Marine Science Centre. Mr. Doucet has worked with small and medium-sized businesses to develop a variety of innovations, while Dr. Garber has developed a selective breeding program for salmon. This is a syndicated post. You can view the original post here: UNB Researcher Nabs Innovation Prize for Pioneering Work on Energy Systems. Donna Allard liked this on Facebook. Dave Hatfield liked this on Facebook. Jo-Anne Grant liked this on Facebook.